With the traditional push carts patrolling the small restaurant, it wasn't hard to get everything we wanted quickly. We started off with the obligatory Haw Gow (steamed shrimp dumplings). We were impressed with the size of these suckers. As you can see, they fill up the whole bamboo steamer. The shrimp filling was quite good, packed with crunchy shrimp devoid of veins. Only modestly seasoned, we could taste the shrimp. However, the dumpling skin was a bit gummy. 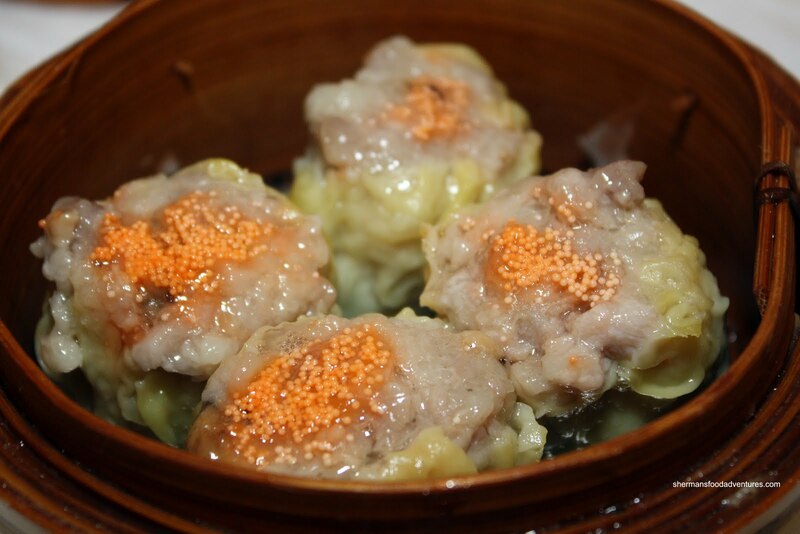 The usual partner to the haw gow are the Sui Mai (pork & shrimp dumplings). For as long as I can remember, the shouts of "haw gow, sui mai" from the Dim Sum cart ladies, complete the atmosphere. Too bad so few places have push carts anymore. As for the sui mai, they looked good and tasted equally good. With a chewy texture exhibiting a nice "bite", these were also lightly seasoned. I could taste the pork while not so much that it was overwhelming. For a reasonable $2.25, it will get you most items on the push carts. However, a few items command a slightly higher price at $2.80. This includes the Rice Noodle Rolls. 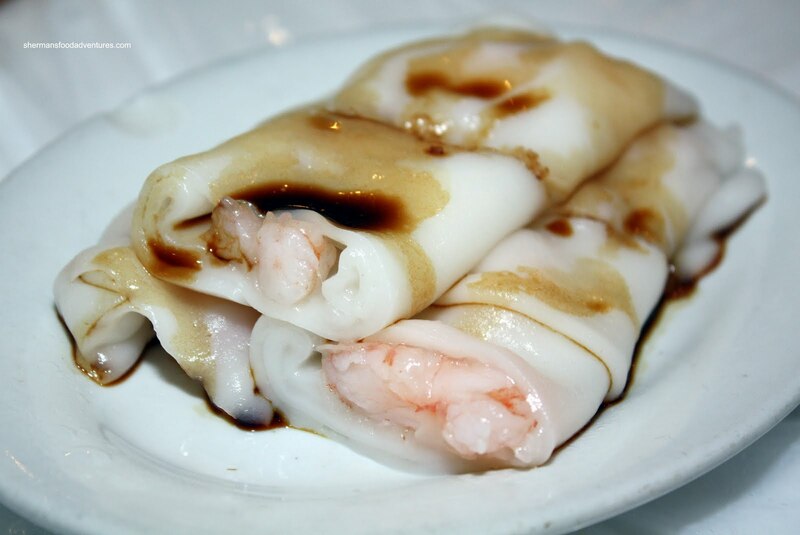 We got one each of the shrimp and beef rice noodle rolls. Slightly on the thicker side, the rice noodles were still quite soft; yet still holding their shape. There was a good amount of properly cooked and prepared filling. I must remark that they really cook their shrimp properly here. Everything that had shrimp in it was done the right way. 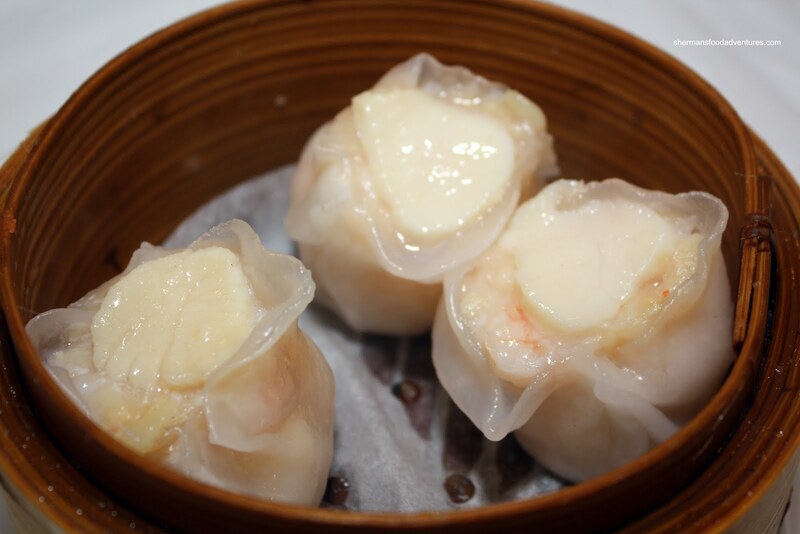 And that goes for the Scallop & Shrimp Dumpling as well. With a thin, albeit real piece of scallop on top, the shrimp was juicy, crunchy and not overseasoned. Still wasn't a big fan of the wrapper; but it wasn't a really big deal. Then I ordered 2 dishes just to test out if RBC (our only non-Asian at the table) would be adventurous or not. Apparently he was not. I even tried putting the 2 dishes right in front of him to hopefully provide some motivation to try. He didn't bite and kept asking for BBQ Pork Buns. So what were the 2 dishes that didn't tickle his fancy? 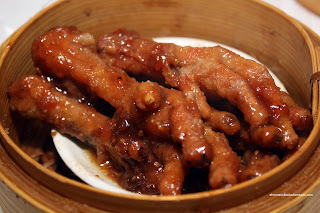 The first was the Phoenix Talons (or chicken feet). I guess to the uninitiated or those who never g rew up with the stuff, the chicken feet do look a bit intimidating. For me, I like 'em and these ones were good. Soft and gelatinous underneath the fried skin, it had good flavour from the oyster-based sauce. 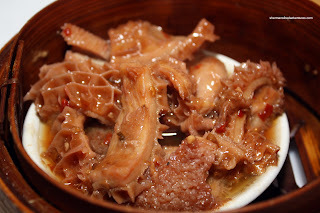 The second dish was the Beef Tripe or in this case honeycomb tripe. I think RBC intentionally tried not to look at it. He just kept asking for BBQ Pork Buns. We assured him that they would come by. In the meantime, I kept pestering him to eat some tripe. He stood his ground and did not. Oh well, his loss! The tripe was the perfect texture where it is soft while still being slightly chewy. Flavourwise, there was none of that gamy tripe flavour which is a good indication that it had been run through cold water long enough. The sauce had a good balance between salty, sweet and a bit of spicy. 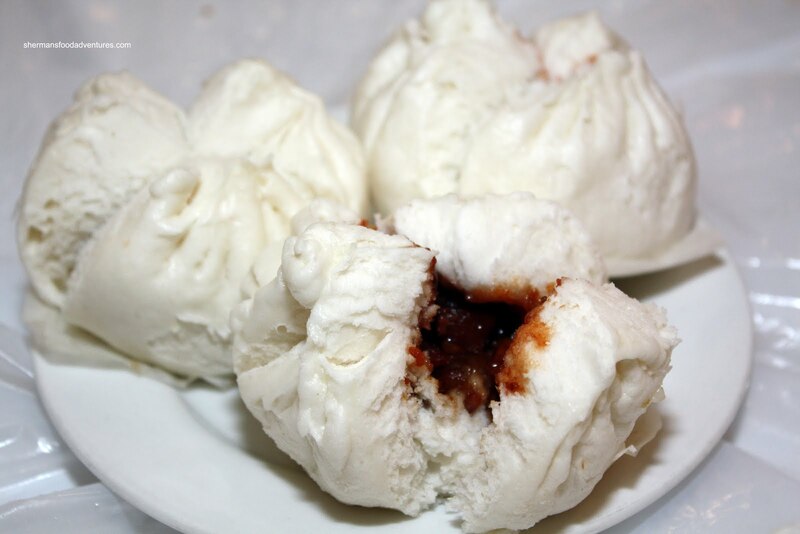 Alas, the BBQ Pork Bun did come around and we got an order to pacify RBC. He had no shame perpetuating the stereotypical non-Asian who is afraid of anything that doesn't look familiar. Next time, I'm going to stuff some tripe into his BBQ pork bun! And these buns were pretty fluffy with a nice amount of filling. In fact, we also got some Custard Buns and those were good as well, if not a bit too sweet. 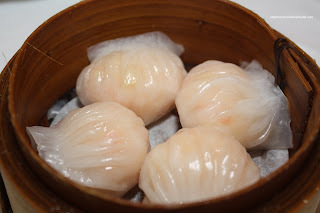 I could go on about the other 5 dishes we had (yes, we were hungry); but I'd be just repeating what I've been yakking about all along - The Roc offers up some decent (dare I say, "good") Dim Sum on the cheap. Sure, we were packed like sardines there and the service is sparse (they are nice though). Yes, there will probably be a wait as well; however, it's worth it in my opinion. As long as your expectations are realistic. 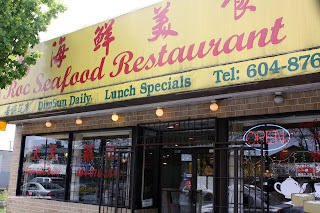 Believe it or not, The Roc was among the first, if not the first dim sum place I went after moving here to Vancouver! I wholeheartledy agree with your thoughts of this place. It is cheap, ambiance is lacking and the food is quite good for the price. Can't or shouldn't compare it to Kirin, for what it is, where it is and how much $$$, it is good. Hey thanks Sherman. Now I know a new push-cart dim sum no more than 10 mins drive from me :-) I drive by them everyday to/from work yet have never inclined to try them, let alone for dim sum. I imagine they are cheaper and not quite as good as Dai Tung down the street ? Kim, I concur. A must try for those who like it cheap, but good! LR, honestly, compared to the last time I was at Dai Tung, the Roc is better. Of course, I could've went on an off-day at DT. But I swear the Roc has gotten better over the years. It is cheaper than Dai Tung for sure. I hate the push carts because they are quite dangerous for little kids or unpredictable accidents. I've worked in an dim sum place with push carts and some people would accidently, knock off the hot steam basket and you would guess what happens when hot liquid hits the skin... The food would get over cooked and when cooking food its like science, can't be rare and can't be over done. People might like the unusual presentation of the push cart but from someone who've seen it all, I'm glad they are disappearing! Doug, I don't disagree with you there. I much prefer to order what I want and it comes out perfectly cooked. Also, I don't have to wait for the Haw Gow to come around! However, some people like the nostalgia and also, most places employ the "recessed" push carts now, where the steamer baskets cannot be knocked over. Hmm, I haven't been to the Roc for awhile. Like you, I am finding the consistency and variety lacking at Dai Tung and have been trying new places. New ones I've been to include the one on Victoria and 43rd (sorry, forget the name, it's next door to a chinese grocer on the corner at the cross lights) and a new revamped restaurant on Hastings one block west of Nanaimo (sorry, forgot the name again). They both don't have push carts which I miss. Where else would those push cart ladies find minimum wage employment ?!? I agree with Doug the push carts don't elevate the quality of food, but more likely degrade it. But there is a nostalgic component to it, which to me, is worth it. I gotta admit, for myself I'm not usually in my "foodie moodie" when dim summing, as DS is about conversations with the people you go with. And even if carts do allow foods to become overcooked, I would guess at good quality places the items would turn over fast enough that they wouldn't actually sit in the carts long enough to become noticeably inferior. At the end of the day, I like to see the push carts establishments stay as is, so we have a choice between them and establishments that serve directly out of the kitchen. Holly, I think that the restaurant on Victoria you are referring to is Li Garden and the one on Hastings is Golden Star. Both are solid IMO. No push carts as you mentioned. Victoria & 43rd = Zhen Hua ? Hastings west of Nanaimo = Golden Star ? Maybe the webbed duck feet are more to RBC's liking. Can't even image how he would react to pork bung. Kaiser, the webbed duck feet would scare RBC off for good!